I love the colour yellow. Absolutely adore it. I think as far as colour love goes, it's right up there with green. And this here is my favourite shade of yellow. But sadly I don't think I pull it off very well. When I first saw Solar Power on ALU I had to have it. It's a beautiful deep yellow. You remember the deep yellow Laurentian pencil crayon from our childhoods? Yeah, it's that yellow, but with shimmer. How could you not love it? Anyhow, here are the pictures. 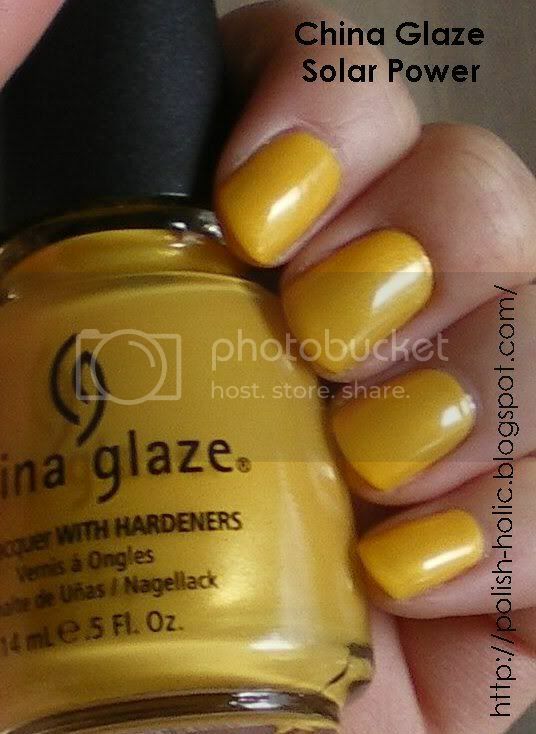 China Glaze Solar Power in shade. 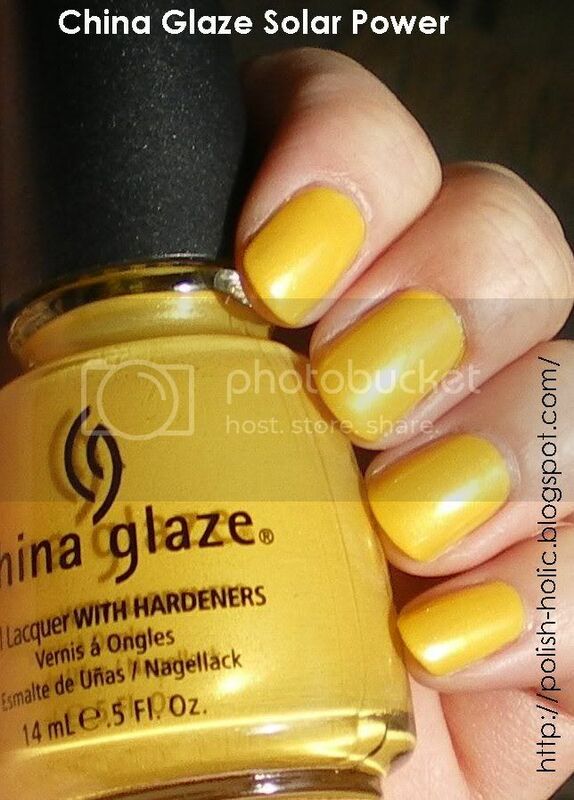 China Glaze Solar Power in the sun. Sadly, the yellow in my skin combined with the yellow in the polish makes me look pasty. Guess that's what happens when you're Asian. But on to polish performance, it's a bit sheer, that can be expected with something so light though. This took three coats and it's not 100% covered yet. I ended up with weird streaky patches. And from what I remember, polish was slightly goopy, but not too much. I found this dried just a little bit faster than most polishes, in between coats. But at three coats, it's going to take a while to dry anyway, unless you have a quick dry top coat. *Looks at fingertips* Oh it makes me so happy. I love this shade of yellow. It's so nice and bright. I'm always buying yellow's. Looks very pretty on you. I love my bright yellows. There's just something about them. It just makes me think of sunshine and makes me happy. I bought this color because I loved it, also. Sure enough, it brings out all of the yellow in my skin, too, and I'm not Asian... I'm a super duper pale olive tone. (?!) I know. Weird. But that's the only way I can describe it. And I don't tan, I burn. How's that for a giant pain in the @$$? But it is a gorgeous color. I'm gonna franken with it, or round up my dog, and paint her nails!